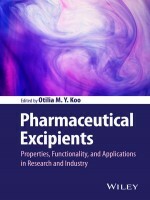 This book provides an overview of Excipients, their functionalities in pharmaceutical dosage forms, regulation, and selection for pharmaceutical products formulation. It includes development, characterization methodology, applications, and up-to-date advances through the perspectives of Excipients developers, users, and regulatory experts. It also describes the physico-chemical properties and biological effects of Excipients, discusses chemical classes, safety and toxicity, and formulation and addresses recent efforts in the standardization and harmonization of Excipients. This pathbreaking publication has been penned by Otilia M.Y. Koo, PhD, is currently Integrated Development Team Leader at Bristol-Myers Squibb Company. Her research interests and publications are in excipients characterization and the role of excipients in formulation development and processes. She serves on the 2015 - 2020 United States Pharmacopeia Expert Committee for Excipient Monographs and was lead guest editor of themed issues of the AAPS Journal and AAPS Pharm SciTech.